The temperature-controlled impulse chamber vacuum sealer FCB-200 boasts a high vacuum rate at about -100Kpa (10 torr). With the built-in vacuum gauge, a simple operation allows the user to adjust the vacuum rate in the range of -50 to -100 Kpa (385 to 10 torr) depending on the packaging contents. This food sealer uses a 10-degree tilt chamber. The chamber is lower in the front to prevent liquid from spilling out of the bag. Commercial sealers use impulse sealing technology that has been fostered over the years by Fuji Impulse. When the power is turned off the sealer will automatically run the vacuum pump for three minutes to clean out the collection of dirt and other foreign objects, reducing daily maintenance work. The chamber vacuum uses the impulse sealing technology that has been fostered over the years by Fuji Impulse. These advantages of Fuji Impulse sealer provide support for your work tool in your unique environment. The other main advantage of FCB-200 is that the machine is equipped with ONPUL system. Only Fuji Impulse offers a chamber vacuum impulse sealer equipped with heating temperature control. 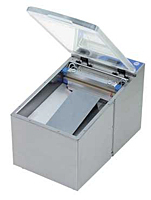 ONPUL is our original, revolutionary sealing system with a heating temperature control function – an adjustable heating temperature range of 60 to 200C/ 140 to 392F, and an adjustable cooling temperature range of 60C/ 140F to uder-defined heating temperature – , this chamber vacuum sealer allows user to set the perfect heating and cooling temperatures for the material and thickness of your packaging material. Once set, the sealing condition (heating and cooling temperatures) will not be affected by changes in the work environment temperature or rise in the machine temperature due to extended use. Setting the heating temperature at the film-fusing temperature means no heat or excessive energy is wasted, making this an economical choice. Cutting back the unnecessary time for excessive heating increases work efficiency. No unnecessary heating means the product life of consumable parts such as the heating element and Teflon sheet is extended. Errors such as temperature sensor disengagement and the lid being left open are displayed as a numeric error message on the LCD screen. If a problem causes the heating process to continue beyond the first 8 seconds, the anti-overheating-circuit device automatically shuts off to prevent fire hazards. Compact design takes up minimal work space.